This view of Arbela Sulcus, a 24-kilometer-wide (15-mile-wide) region of furrows and ridges on Jupiter's moon Ganymede, shows its relationship to the dark terrain surrounding it. 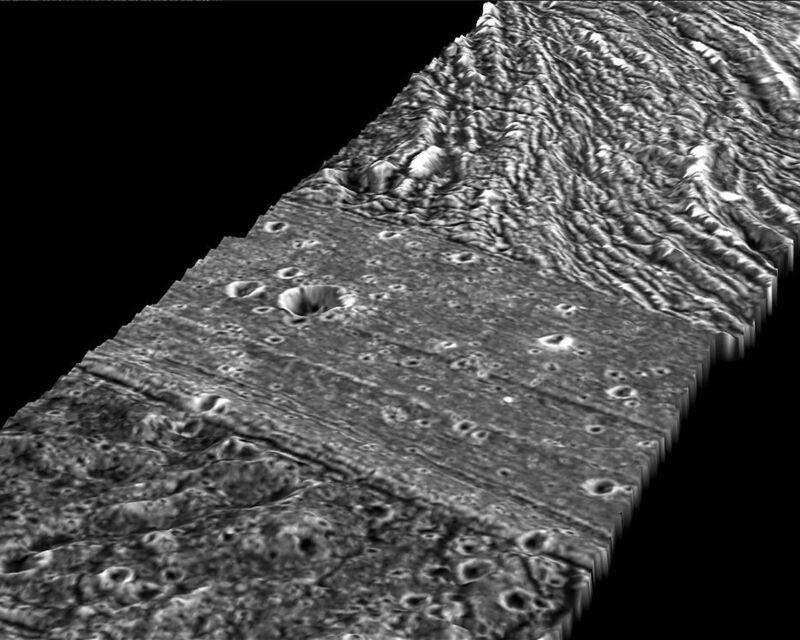 NASA's Galileo spacecraft took these pictures during its May 20, 2000, flyby of Ganymede. Arbela Sulcus lies overall slightly lower than the dark terrain of Nicholson Regio, a 3,700 kilometers (3,300 mile) area in the southern hemisphere. 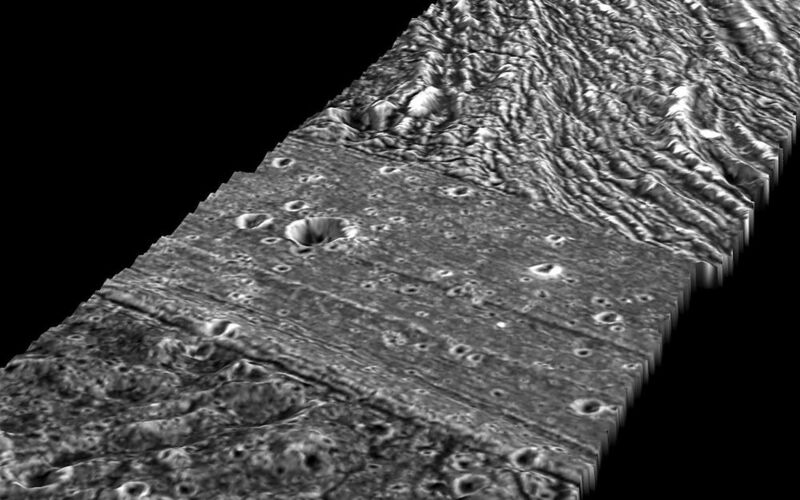 However, along the eastern margin (bottom), a portion of the dark terrain (probably an ancient degraded impact crater) lies even lower than Arbela Sulcus. 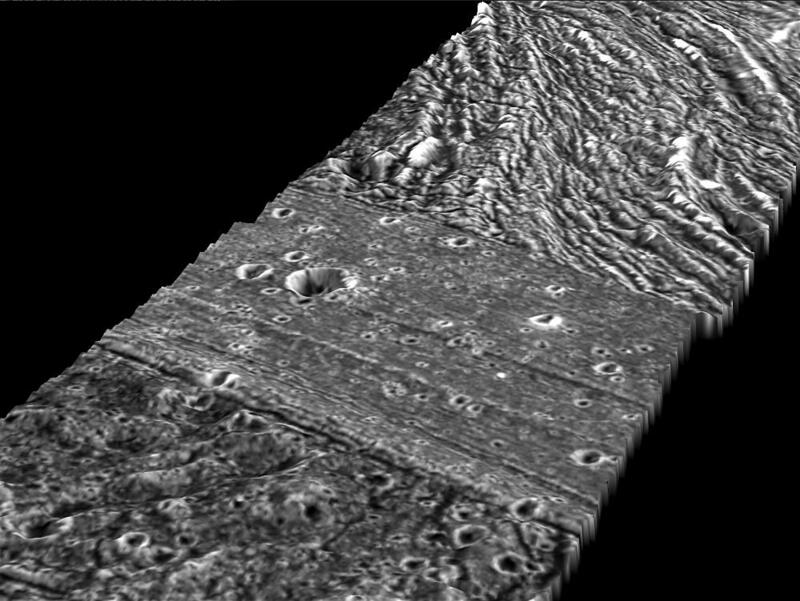 Scientists did not find bright icy material on Arbela Sulcus, indicating that this ridgy area was not created by watery volcanic activity. Instead, they found fine striations covering the surface, along with a series of broader highs and lows that resemble piano keys. This suggests that the movement of underlying tectonic plates deformed the surface. Combining images from two observations taken from different viewing perspectives provides stereo topographic information, giving valuable clues as to the geologic history of a region. North is to the right of the image. The Sun illuminates the surface from the west. The image, centered at ?15 degrees latitude and 347 degrees longitude, covers an area approximately 89 by 26 kilometers (55 by 16 miles). The image resolution is 70 meters (230 feet) per picture element. The images were taken on May 20, 2000, at a range of 3,350 kilometers (2,100 miles). The Jet Propulsion Laboratory, Pasadena, Calif., manages the Galileo mission for NASA's Office of Space Science, Washington, D.C. JPL is a division of the California Institute of Technology in Pasadena.